The busy January rush can mean make or break for many club’s sales figures and set the tone for the year. But with fitness competition now fiercer than ever, how can clubs stand out from the crowd, but stay true to their brand and current members? Let’s investigate. For an industry that places such importance on warm-ups, there’s a certain irony in the frenetic pace at which health clubs start each year on January 1st. With January traditionally serving as the biggest month for new joiners, a good start to the year can help your club steal a strong march on annual sales targets. Better still, do a good job with onboarding your new members and you can rely on a steady stream of revenue from them and their friends for years to come. But as we all know, competition for new members will be fierce. 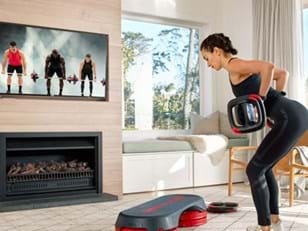 In many markets where potential members are limbering up to exercise away their Christmas excesses, the big TV and billboard campaigns from major players kick off from Christmas Day. Meanwhile promotional offers abound, with gyms jostling for custom with pledges of zero joining fees, discount rates and an array of handy (or sometimes not) free gifts. So in a market where everyone is screaming ‘join us’, how can you cut through the noise? While many of the above strategies are handy for attracting members in the short-term, none are able to keep them as fully paid-up members once the new year resolutions slip and motivation begins to wane. That’s why a growing number of clubs are putting the focus on their group exercise offering during the January sales rush, to achieve both member acquisition and all-important retention by delivering members the results that will keep them coming back. According to industry research, 60 per cent of members state the number of group exercise classes offered by a gym influences their decision to join. Meanwhile, a brand new report from ukactive has found that members who do Les Mills programs three times per week have an average length of stay that is 50 per cent longer than those who do none – equating to a substantial uplift in the lifetime value of a member. What’s more, clubs are able to service a lot more members in their group exercise studios than on the gym floor, helping to avoid those common January grumbles around endless queues for the treadmill and bench press. So how are successful clubs around the world using group exercise to start the new year on the front foot? And what can we learn from them? One of the biggest fitness launches of 2018 has been the partnership between British retail heavyweight Debenhams and established gym operator Sweat! to create a new fitness offering in the former’s department stores. Designed to attract younger female shoppers (Sweat! 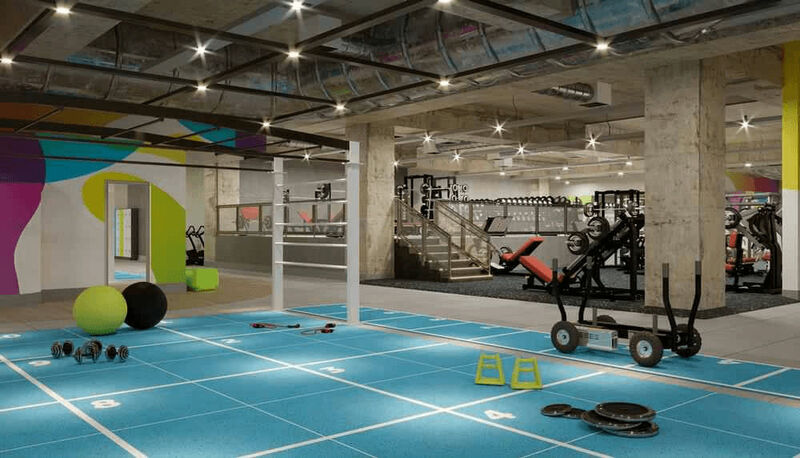 has a predominantly female 18-33 year-old membership base across its six sites), with an in-store ‘social shopping’ experience which optimizes underutilized floor space, the fitness concept generated major headlines when it launched in September in south west London. 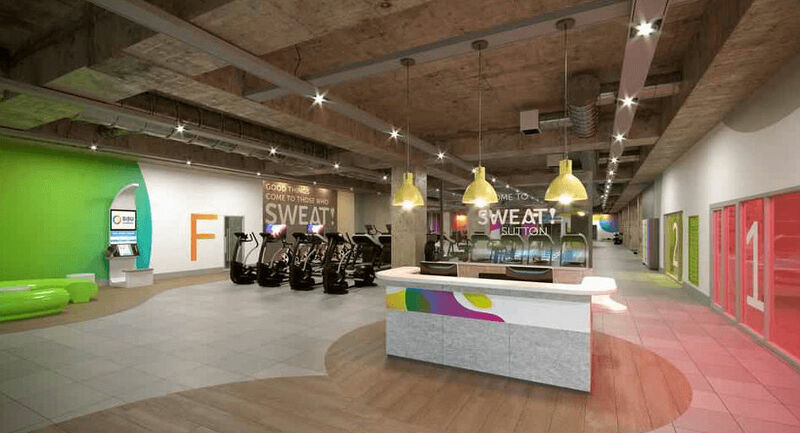 Central to the launch was the 17,575sq ft health club’s focus on group exercise, with Sweat! promising ‘7 boutique fitness experiences under one roof’. Amid the edgy aesthetics and huge walls of mosaic screens sits an array of group exercise offerings, including nine Les Mills programs and a big focus on Virtual Fitness to ensure workouts are available around the clock. As a central tenet of the concept, Group Exercise has featured heavily in the launch, with a big emphasis on the social aspects of working out and shopping, along with in-store shopping incentives offered to gym members which build the more they visit the gym. Memberships currently costs between £30-£40 per month, with the club hoping to reach 3,000 to 4,000 members in year one, with plans for further sites at Debenhams stores in Manchester and Bristol. One of the standout features of the Sweat! 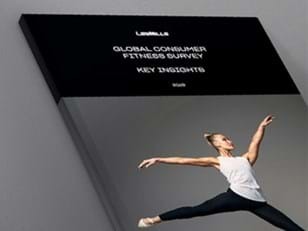 marketing has been the powerful imagery deployed to spotlight the range of group ex classes available, with the club making strong use of the Les Mills marketing assets available on Brand Central to turbocharge its launch and maintain this momentum. 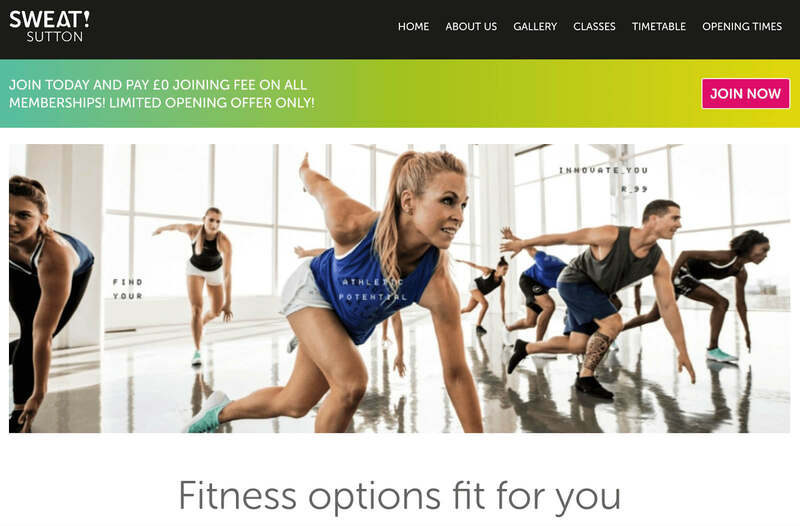 The launch also underlines the latent opportunity for established gym operators with a high-quality group exercise offering to expand their footprint and reach new audiences through symbiotic tie-ups with large retailers. For all of the new possibilities that technology has created for fitness experiences, sometimes the old methods are the gold methods and that certainly still applies to events. As one of the best ways to build a PR buzz around your club, connect with current members and give non-members a reason to visit, launch events can be a hugely effective way to put your club’s offering in the spotlight. 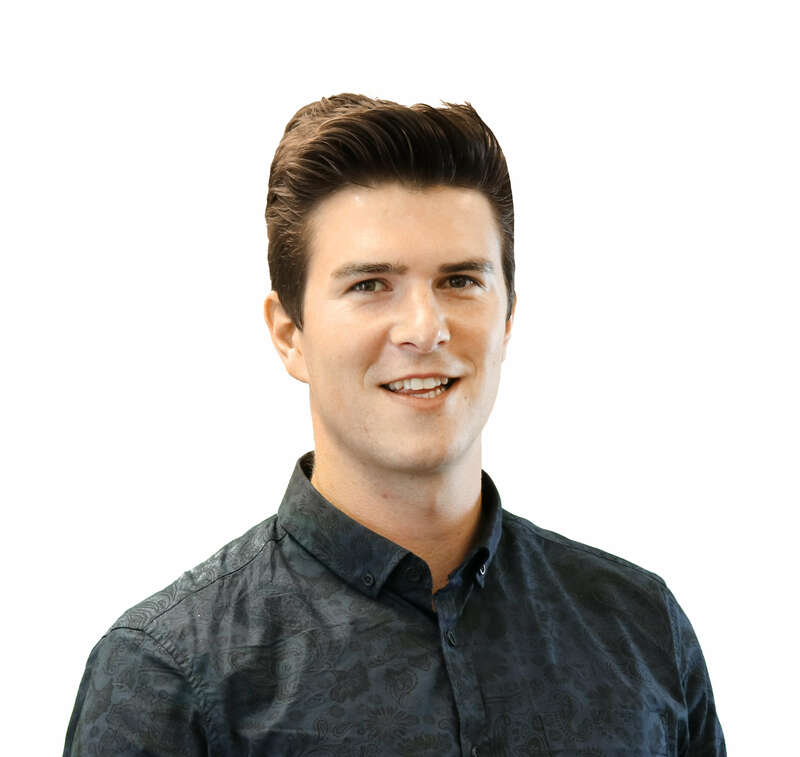 For Jon Van Roo – co-owner of Tahoe Mountain Fitness in in Northern California, a boutique club built around seven Les Mills programs where participants pay up to US$32 per class – events have been a central tenet of his club’s growth strategy. “Launch events are definitely your friend! Aside from our big launch of THE TRIP™, we’ve scheduled in one massive launch event each year and then run quarterly events around new Les Mills releases,” says Jon. Once you attract new members in January, how do you ensure that you keep them? Too often, clubs focus on the sale and then assume the member will be OK if left to their own devices. But with roughly 50 per cent of members leaving their club each year, clearly this is not the case. How you onboard a new member is absolutely crucial to the long-term success not only of that member, but also of your club. According to Ish Cheyne – Head of Fitness at the 12-strong Les Mills New Zealand (LMNZ) chain of clubs, where group fitness typically accounts for 50 per cent of overall gym attendances – starting a member’s journey on a positive note is vital and helping them build social connections is the easiest way to achieve this. This is also an important time to think about how you leverage your star Instructors. Les Mills training focuses on the connection between the Instructor and participants, and in many cases the Instructor will be the reason that new members will either fall in love with fitness or walk away to become part of the attrition numbers in February. Look after your Instructors, and they will look after your members! Another important factor is that many of your new members may be setting foot in the gym for the very first time. Initiating a fitness regime is often one of the biggest challenges they will face, so using group exercise to set them up with a realistic program that offers gradual progression offers a solid start. Given its relative simplicity to take part in, as well as being low-impact on the joints, Cycle has proved highly effective as a gateway into group exercise, both in terms of increasing retention rates among new joiners and boosting their fitness levels. A Loughborough University study (2015) into the effectiveness of an 8-week studio cycling program (RPM™) to improve the cardio-metabolic health of overweight and previously inactive new gym members showed impressive results. Participants were required to take part in studio cycling sessions three times per week, with sessions gradually increasing from 20 to 50 minutes in length. At the end of the 8-week period, the participants’ maximum oxygen uptake (VO2 MAX) had increased by 11.8% and body fat percentage was reduced by 13.6%. Perhaps most significantly, the research showed that a gradual introduction to a new exercise program is key to improving member retention, with participants in this study attending more than 95% of the prescribed workouts. Standing out from the crowd is never easy during the January gym sales rush, but a credible and co-ordinated focus on your group exercise offering can help to attract fresh faces and ensure they are set up for a long and valuable stay at your club. By making an impact with your marketing, leveraging the power of events, creating close communities and onboarding with aplomb, your club can get ahead of the competition and put itself on the fast-track to a fruitful year of success. For a free consultation on making the most of group exercise in your studio.